BATWING Digital Pro™ is IRONWEAR’s™ new digital jump rope with adjustable rope tip and rubber rope. 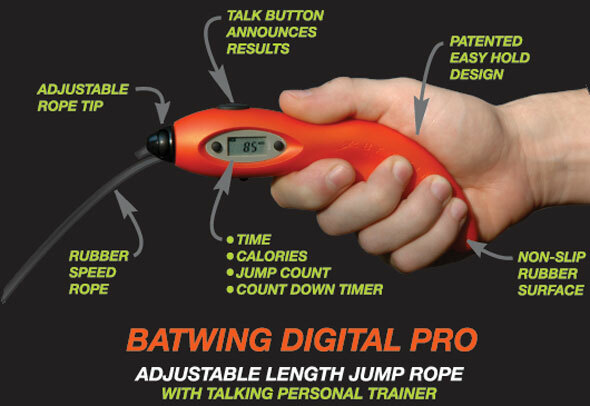 The BATWING Digital Pro™ has an electronic talking trainer and display to help you monitor and improve your jumping. BATWING Digital Pro™ includes many of the latest IRONWEAR™ features: the patented BATWING™ handle design that requires less wrist movement, a digital display with simple controls, an internal speaker that announces your progress while you jump, and a rubber rope with easy length adjustment system. BATWING Digital Pro™ handles are designed to prevent the injuries experienced by professional boxers who use jump ropes as their main form of aerobic exercise. Boxers can develop wrist and hand problems caused by the excessive twisting of the wrist and tight grip required by standard jump handles. BATWING Digital Pro™ unique patented handle design removes the need to excessively bend the wrist, while at the same time reduces the force required to grip the handle. Extensive form studies were done to develop the shape so that it fits comfortably into the hand, holds the rope at the correct angle, and locks in place naturally without a tight grip. The BATWING Digital Pro™ handles are also rubber coated to help keep the handles form sliding out of the hand during intense workouts. Number of jumps. Calories burned. Time spent jumping. Countdown timer for time remaining. You can also switch between modes with the press of a button. BATWING Digital Pro™ “personal trainer” mode, when turned on, will automatically announce your progress in any of the monitoring modes. For example, the BATWING Digital Pro™ will announce the number of jumps every 50 jumps, the number of calories burned every 20 calories, the amount of time you have jumped every minute, or the time you have remaining to jump every minute. BATWING Digital Pro™, “number of jumps” mode displays the number of rotations the rope makes around the handle. The handle has a button positioned just below the display to reset the counter to zero to start. No more counting is needed. The digital personal trainer can be set to announce your process every 50 jumps. To know your progress at any time you simply push the announcement button with your thumb. A quick touch will announce only the number of jumps, while holding the button down will announces the number of jumps, calories burned and the time. BATWING Digital Pro™, “calories” mode displays the number of calories burned. Simply input your weight and the BATWING Digital Pro™ calculates and displays the average number of calories burned for each jump. The handle has a button positioned just below the display to reset the counter to zero to start. No more guessing. The digital personal trainer can be set to announce your process every 20 calories. To know your progress at any time you simply push the announcement button with your thumb. A quick touch will announce only the calories, while holding the button down will announce the number of jumps, calories burned and the time. BATWING Digital Pro™, “time” mode displays the amount of time you have jumped. The handle has a button positioned just below the display to reset the timer to zero to start. No more checking the clock. The digital personal trainer can be set to announce your time every minute. To know your progress at any time you simply push the announcement button with your thumb. A quick touch will announce only the time, while holding the button down will announce the number of jumps, the calories burned, and the time. BATWING Digital Pro™, “countdown timer” mode displays the amount of time you have left to jump. This mode allows you to set the amount of time you want to jump and then counts down and lets you know when you are done. The handle has a button positioned just below the display to reset the count down timer to zero. The digital personal trainer can be set to announce the remaining time every minute. Or to know your progress, simply push the announcement button with your thumb. A quick touch will announce the time remaining while holding the button down will announce the number of jumps, the calories burned, and the time. BATWING Digital Pro™ is supplied with a 5mm rubber rope that is great for both tricks and speed. The rope has been packed in a large coil to prevent kinks from forming in the rope. The rubber rope is durable and flexible. The rope can be cut easily to length with scissors. BATWING Digital Pro™ has a special rope attachment tip that makes it easy to attach, replace, and adjust the length of the rope. The rope simply loops through tip and the tip locks the rope in place.